Culling an early limit, Steve Stroman sight-fished to victory during the Toyota Tundra Bassmaster Weekend Series, operated by American Bass Anglers, Texas East Division 11 tournament, held March 12, 2011, on Lake Tyler. With relative calm wind in the morning, the 28-year-old angler from Pittsburg, caught an early limit on a small crankbait. Later, despite gusty conditions as the day wore on, he upped his weight. At the end, he brought in five bass going 19.64 pounds to win more than $2,500. In all, he caught about 11 keepers without any short fish. "We had a limit fairly quickly," Stroman said. "Then, we went sight-fishing for big ones. I caught five sight fishing and culled everything I had. In the morning, we caught most of our fish on small natural shad crankbaits. Once I started sight-fishing, I caught my fish by flipping jig in black, brown and amber with a speed craw for a trailer." Running out of Lake Tyler Marina, the anglers could fish either Lake Tyler or Lake Tyler East. Part of the Angelina River system, Lake Tyler covers about 2,224 acres southeast of the town of Tyler. It connects to the 2,276-acre Lake Tyler East through a canal. Clear water in the system makes sight fishing at this time of year a hot technique. In second for the boaters, Terry Peacock, 49, of Royse City brought in a tournament limit of five bass going 17.29 pounds with a 6.76-pound kicker. He caught nine keepers on the day, returning home $1,257 richer. "I fished isolated grass in shallow, dirty water," Peacock said. "The weather helped me. The cold nights kept the fish from moving up and that hurt the sight fishermen. I caught every one of my weigh fish by flipping a beaver around docks with grass around the edges. The fish wanted it really slow. I lost a really big fish right off the bat." In third for the Boater Division, David Gillham, 47, of Heath landed five bass for 16.68 pounds. Catching a total of 35 fish, he ended with $860. "I saw a lot of empty beds with a fair amount of grass in the area, so I knew the bass were still there," Gillham said. "In the first place I fished they were scattered, but I started catching some and stayed in that area. I was fan casting because they weren't locked on the beds. I fished a 5-inch senko and a green pumpkin lizard on a split-shot rig dragged slowly over scattered grass in about five to six feet of water. The fish were biting very funny, but those Kistler rods are incredible and very sensitive." In fourth for the boaters, Kevin DeShane of Midlothian caught five bass for 16.51 pounds with one 5.91-pounder. William Isaacs of Ladonia landed in fifth place with four bass going 15.95 pounds, including an 8.12-pound bucketmouth. However, Shawn Temple of Lewisville beat that lunker with a 9.23-pound bucketmouth that took big bass honors. In the Co-Angler Division, Toby Wallace, 42, of Tolar landed three bass for 12.90 pounds. Fishing his first ABA tournament, he earned $1,257. "We fished some bedding fish," Wallace said. "I caught them on a Rayburn Red Xcalibur rattling bait fished on fluorocarbon. We had to hit certain types of grass in the right spot and keep pounding them. I quit fishing at 11 a.m. to let my partner catch them." In second, hometown favorite Ty Faber of Tyler caught a division limit of three bass going 11 pounds with one 5.66-pound kicker. Jason Prestridge of Azle took third with three bass for 10.20 pounds, followed by Robert Reddell of Justin with three bass going 10.06 pounds. 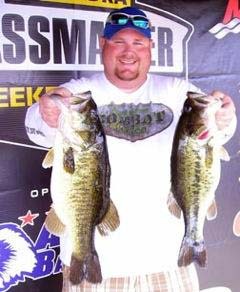 Rounding out the top five co-anglers, James Painter II of Grand Prairie brought in three bass for 9.12 pounds with one hitting 4.72 pounds. Robbie Carson of Carrollton took division lunker honors with a 5.76-pounder.